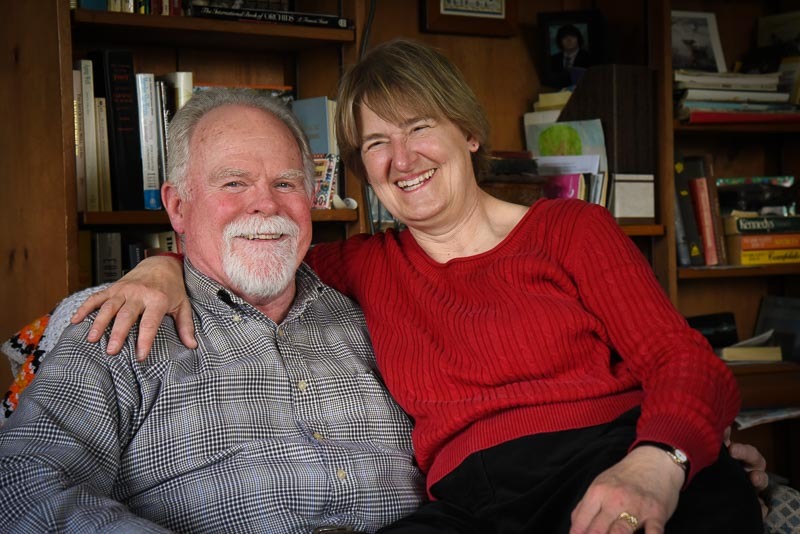 Beth has been the pastor of the Lutheran Church in the San Juans, encompassing congregations on San Juan, Orcas, and Lopez, since 2014, and before that for 27 years in Colorado and New Mexico. Dave has been practicing marriage and family therapy in Friday Harbor for almost 32 years. Fr. Doug Simonsen will perform the ceremony at St. David’s Episcopal Church on Saturday, April 30, at 1 pm. Music is a big part of both their lives. Dave has been playing trumpet with the One More Time Band for 30 years, and also plays Taps on request for many occasions. Beth plays several instruments — “none of them well,” she claims. Jenepher Reeves will provide the wedding music, there will be solos by Sue Collado on the oboe and Dorothy Baker on the piano, and the One More Time Band will play for the reception at the Mullis Center following the ceremony. And guests will be welcomed to the church by Helen MacKay Sanders of Lopez on the bagpipes. Their wedding trip will take place in August, to England and Scotland, with the Royal Edinburgh Military Tattoo as a highlight. Beth, who has not been married before, will gain a son and daughter and four granddaughters; and Dave is gaining a beautiful golden retriever, Tau. They will live in Dave’s Friday Harbor home. West and I have known Beth since she was about 19/20 years old, and we have known David at least 20 years. Very, very happy for you both! Pr. Beth was our pastor at St. Luke Lutheran in Albuquerque. We absolutely adore her, and are thrilled that she has found her soulmate! Our heartiest congratulations to both of you, Beth and Dave. Dave, we cannot wait to meet you! We will look forward to seeing pictures of your beautiful and joyous wedding. Beth, now we know why God took you back to the Pacific northwest! What a joyous event. All the best to you both. A great spouse is one of God’s greatest gifts, and I hope you are both blessed as I have been. What a joy to know you found each other. I was sad to see you leave St. Luke church where you served us well, but in leaving I was hoping and praying that you would meet someone very special…and indeed you both did! I wish you well in the life you now share and send you my sincere congratulations and my joy that you will have a love and fun filled marriage. Hope to see both of you at a time when I visit my daughter who lives in your area. Congrats to you both. So happy to hear that you, Beth have found your love as did I for a second time. God works in wonderous ways. We received some wonderful news a few months ago!! And now the ceremony to solidify the union is upon us! You look so happy, both of you. We are sure that God will continue to bless you in your marriage and we wish you ever so much happiness.